My super quick surf trip to Portugal comes to an end. It's been a gem, in that I rediscovered an area I first visited some 20 years ago. In the past few days I've checked out Guincho, Sintra and Ericeira - all of which I knew from the past - but have also made sorties to Setubal, Comporta and Sesimbra. Thanks to my host, former Portuguese U18 and U21 surf champ Miguel Champalimaud, I now know that there are a host of top breaks from Cascais to Lisbon. They light up in winter but today I had some lovely and mellow late spring waves at Guincho. I was in the water with Miguel, who is the general manager of the nearby Oitavos Hotel. Look out for a piece about all this in the FT soon but suffice to say, for now, that Miguel is quite something: surely the world's only manager of a five star hotel who also rips? The evidence, at his favourite wave (Coxos, up the coast at Ericeira) is pictured here, while I can testify that Miguel's slick backhand and frontside off-the-tops were the best on display today. Surf Apps - which are the best? Here I am in a pousada in Portugal. How did I get here? It's a short story but there's no time for it now. Suffice to say that I'm writing something about surfing for the FT and my car hire was arranged through a good lad from Ireland called John, who works for Nova Car Hire. I am driving what can only be described as an amazing vehicle, though sadly the surf has been onshore thus far. It looks set to change on Tuesday morning - or, at least, be caressed by a gentler wind and not therefore be blown out - but meanwhile here's John with some thoughts on surf apps. Surfing the Net is all very well, but for some people, surfing is all about waves. If you are one of those people whose idea of fun is pitting yourself against the mighty ocean, armed only with a strip of polysterene and fibreglass, your iPhone could prove to be a surprisingly useful friend in the eternal quest to catch the next awesome wave. Keep tabs on your favourite surfer, monitor the swell, keep up-to-date with forecasts, learn about the world’s best waves, and predict the tides. Surf’s up with an app! This is not strictly a surfing app, but it will prove vital when you are checking ocean conditions anywhere. It features data from more than 120 buoys spread across North America, Europe, and the Caribbean, detailing current swell, wind, temperature, and other weather conditions. Mobile access to these buoys means you can predict what the ocean has in store for you on any given day. Now, you will always know if the swell is hitting your local area, or if the winds have switched offshore yet. And all at the touch of a button. Surfers everywhere rejoice! Surfline’s premium forecasting services are now available in a free iPhone app. Their impressive short- and long-term forecasting tools are now at your fingertips, together with access to current reports and high-quality live cams for surf locations worldwide. Download this app for your iPhone, and you are sure to use it constantly. The World Surf Atlas tells you all you need to know to plan your next trip to any of the world’s top surf spots. This excellent overview incorporates detailed information for 500 of the world’s best waves, including descriptions of the waves, the sea-bottom (sand, rocks or reef), the wave direction, hazards, average temperatures, wetsuit information, and GPS data. It also features maps of all the world’s most important surf regions. There is no point in paddling out if you don’t know the tide. The Shralp Tide app can identify your current location and deliver tide info for the next five days. Simplicity and speed make this a great app. The tide information you’re looking for appears within seconds, and, because it’s available on a five-day forecast basis, you can plan your surfing activity week to week. This app allows you to keep tabs on the best surfers in the world as they vie for points on the World Tour by following the results from each event. The most awesome feature lets you watch events live from your phone. It includes detailed information about each event during the contest, including event status, results, photos, news, video highlights, and the live stream. John Falvey works for Nova Car Hire, a popular site offering car hire in more than 26,000 destinations. When everybody else is sensibly taking refuge from the chill Atlantic winds, John prefers to grab his surfboard and catch the waves at Inch Beach or Castlegregory, Co. Kerry. His favourite vacation location is the incredible surfing resort of Playa de Famara in Lanzarote, in Spain, and he believes there is (almost) nothing a good day’s surfing won’t cure. What's more amazing - Joey Barton's conduct during QPR's game against Manchester City last Sunday, or his post-match tweets? I penned a short piece for today's Times (in the sport section) on Barton and the law. A line in said piece read: "We can all make mistakes and some of us can lose our tempers". I deliberately included this to convey a sense that I don't feel holier than thou when it comes to Barton. As Wrecking Machine outlines, I have made more than my fair share of mistakes, and many have been down to a poor grasp of rectitude (Er, you mean: psychotic temper control problems. Ed). Hearing that the same old stuffs going on back home. People scrambling round, trying to write idiotic stories. Tut tut. Ah, well....LGO! Surely there is someone close to Barton who can have a word and talk some sense into him? As I wrote yesterday, I think QPR should sack him. But to preserve a career in football - or to set one up elsewhere - Barton needs to show some contrition. It needs to be genuine; it may be beyond him. Who knows. But what is certain is that Twitter is a ready, if unwitting, accomplice in what seems to be a quest for self-destruction. Social media, in the hands of someone like Barton, is a very dangerous thing. What a day yesterday. I was at the Etihad for The Best Game Of Football The World Has Ever Seen. I speak, of course, of Man City v QPR. It was awesome. Where to begin? Most importantly, QPR avoided relegation. Secondly, Man City won the title for the first time in 44 years. Good to see another club than United at the summit. Thirdly, after such a superb performance yesterday the future is surely bright for the Rs. I reckon we will do well next season. The game had it all. Even a delusional fool who writes - someone like me - couldn't have written its script. Hats off to every QPR player but especially Jamie Mackie, who I singled out for praise when I was moved to call 606 from a motorway service station on the way home. I'm on after about 40 minutes if anyone is interested. Mackie has worked tirelessly all season and a couple of months ago scored the vital winner in the Rs' 3-2 win over Liverpool. He's got real heart and is a genuine player - as shown by the way he came over to the Rangers' fans at the end of the game. Also there for some time was Anton Ferdinand, a player who's handled himself very well all season. The same is sadly not true of Joey Barton. His conduct yesterday was a disgrace. What is all the more astonishing is the way he's subsequently lashed out at everyone on Twitter. I was going to say, when asked by Alan Green on 606 yesterday about Barton, that I felt a little sorry for him - after all, I know all too well about recidivistic temper problems - but having read Barton's egregious and arrogant post-match tweets I'm glad I didn't. Forget the crafty media invention and appearances on Newsnight: Barton is a thug, pure and simple. As a QPR fan for nearly 40 years, I'd like to see the club throw the book at him. If he can't be sacked, he should be fined heavily and, once he's served what will inevitably be a lengthy ban, condemned to the reserves next season. Having seen many Rangers games this season the truth is that even when he hasn't been losing the plot Barton has not once merited more than a seven out of ten for his performances and is usually hovering at the 5/10 mark. More to the point, it's hard not to infer, from everything Barton does and says, that he's a destructive influence all round. Surely the club would be better off without him next season? Aside from yesterday's trip to Manchester, life remains a case of all work and no surfing. I hope to remedy this soon and, for those loyal enough to tune in here in the hope of something surf-related, have something a little more on topic to say. Meanwhile, with thanks to Jess&Mark, an image of QPR gives at least a hint of thematic coherence to this blog. I return to this blog after a lengthy absence caused by immersion in the business of writing. 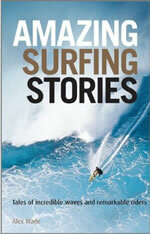 I'm pleased to say that I have now finished a book called Amazing Surfing Stories. Yes, I admit that the title is a bit full-on, redolent of wonders which have hitherto hid their lights under bushels but which now shine thanks only to my talent for the destruction of bushels, but I hope that when it appears my legions of fans (last count: three) will agree that there is quite a mix of curios in the book, with at least one story set to engender serious literary revisionism for yes, I have uncovered cast-iron evidence which reveals that when a particularly famous writer disappeared for a while, many moons ago, she was actually on a surf trip. Talking of moons, someone told me that NASA has photographic evidence of a left hand point break on the moon which is as long as the River Thames. Could this be true? Of more genuine import is Huck's latest competition by which you can win some Thomas Campbell artwork. Check it out here. What else is new? A lot, probably, but I know nothing because, as my latest column in the new look Wavelength says, all I've done lately is sit and write. Once I was a Wrecking Machine, now I am a Writing Machine, maybe one day I'll be a Washing Machine. But I have seen two wonderful films in the last couple of months, and I don't mean The Artist (again). Check out both Come Hell or High Water and Splinters when you get a chance. The former is a beautifully shot slice of pure bodysurfing stoke featuring North Shore legend Mark Cunningham. The latter is a portrait of surfing in Papua New Guinea which as much as it celebrates the emergence of surfing on PNG also brings into focus uncomfortable truths about the way in which misogyny is often culturally embedded. Both are welcome and excellent additions to the surf movie genre (in fact, they go a long way to transcending it, which is no bad thing). What else can I report? All kinds of things but they'd be of limited interest to those who read this blog because it's (ostensibly) about surfing. I can say that I have witnessed QPR on a few occasions since the new year, and that I will be at Manchester City next Sunday for our 4-1 win. This is a result that no one expects but that is exactly what was said when the Rs travelled to Manchester for the New Year's Day massacre in 1992. Look what happened then - yes, we won 4-1. What price the same result next Sunday?